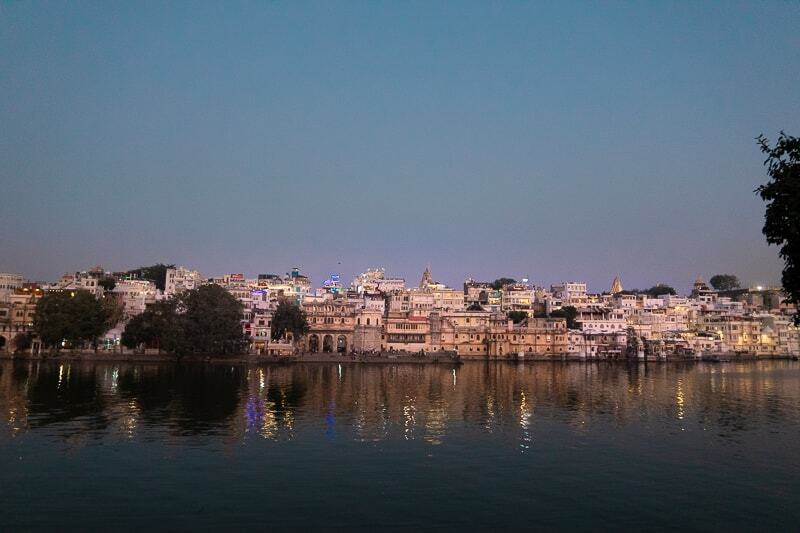 Udaipur is known as the “city of lakes” due to the beautiful lakes that surround it. 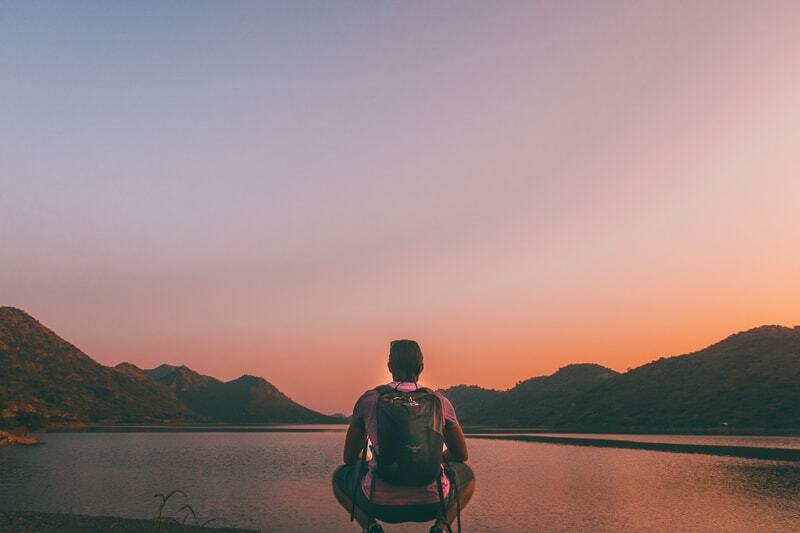 If you find yourself in wondering what to do in Udaipur for 2 days, then check out our guide on the "best places to visit in Udaipur in 2 days". We’ve also included when to go, where to stay and where to head after! It’s pretty much a full-throttle Udaipur travel guide. When is the best time to visit Udaipur? The best time to visit Udaipur is during the winter season. The temperature is more comfortable and it’s actually the peak tourist season for both locals and foreigners making their way through the cultural triangle. So, this makes the best months to visit as September, October, November, December, February and March. How do you get to Udaipur? You can get to Udaipur via bus, plane or train. Flights: You can get flights to Udaipur from all major airports, such as Mumbai and Delhi. Bradley and I flew from Mumbai and it cost around £35. It was only an hour flight, and I had enough of doing overnight train journeys, so it was totally worth it. From the airport, you can get an Uber to your hotel in Udaipur. Train: You can get a train from all over the country to Udaipur. I recommend travelling in 2nd Class AC (although 3rd class AC is also doable, just no privacy). Buy your tickets at the station or a ticket agent to get the best price, and if a train is sold out online, then go to the train station as they typically have some seats left. Bus: Buses are frequent around India and you can easily book a bus online with red bus. There is no need to print anything and you can track your bus which is quite convenient. Buses will be similar to a train price, if not cheaper. 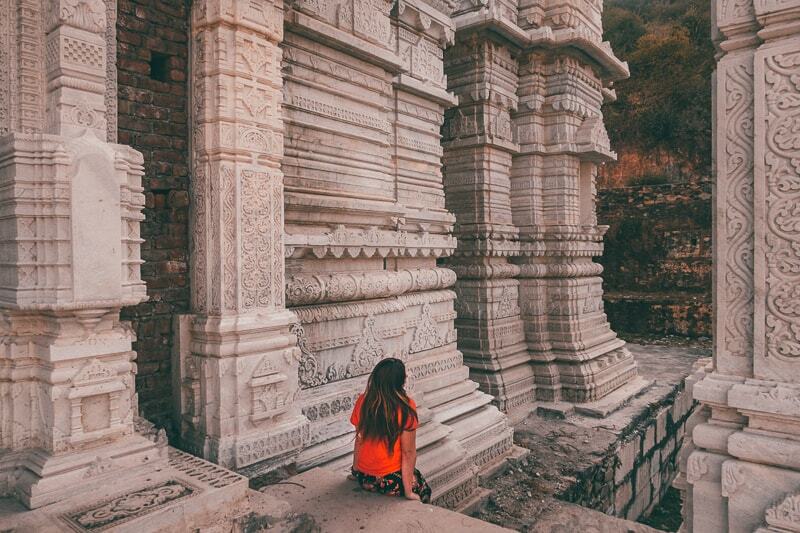 How long should I stay in Udaipur? Well this a two-day post, so naturally I would say two days it quite adequate, especially if you are on a strict timeline. You couldn’t see it all in a day, actually, a day would be wasteful because Udaipur is most beautiful when you explore outside of the city. You could easily stay here 3 days or more, depending on your itinerary. But India is a big country and if you’re taking it all on, then two days is where it’s at! 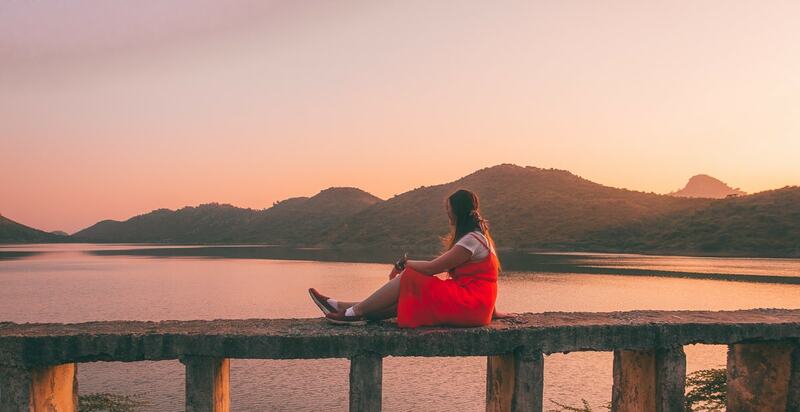 If you're looking for places to visit in Udaipur in 1 day, then I would recommend just choosing 4 things from this list and focusing on that. Where is the best place to stay in Udaipur? There are lots of accommodation choices in Udaipur. You can stay right in the heart of the action, close to the main lake, or you can stay a little bit outside to escape the chaos. Bradley and I choose to stay outside of the main tourist centre. It’s easy to get to and from with Uber and it’s only a 10-15 minute drive (traffic dependent). We stayed in a Treebo hotel, which is a popular hotel chain throughout India. It was fine, there were some teething issues, but the breakfast was decent and the WiFi good, so it did the job. Oh, it was super cheap too. I’ve included a link to the hotel here. You can search for hotels in Udaipur here too. Now for the good part, the top places to visit in Udaipur in 2 days! I will take you through the various places we visited, and some places we didn’t quite make it too. 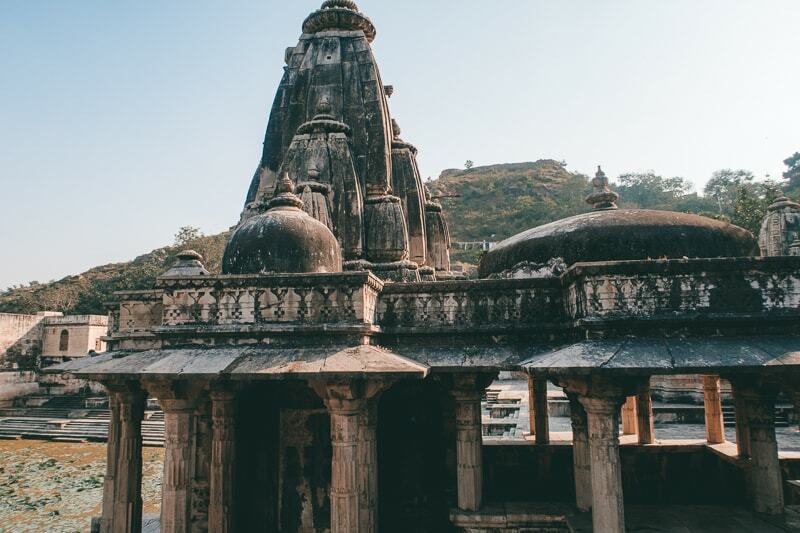 Because we work when travelling, it can cut our “sightseeing” time short, but if you’re just travelling, then you will manage all these sights with two days in Udaipur. As with any 2 days trip, things are going to be busy, but this list is full of great places to go in Udaipur that really very little should be missed. 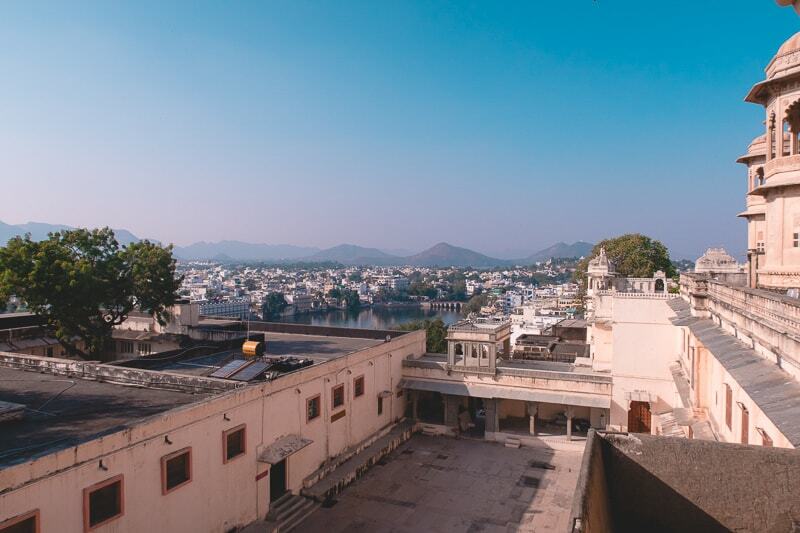 Start your day early to take full advantage of what Udaipur has to offer. 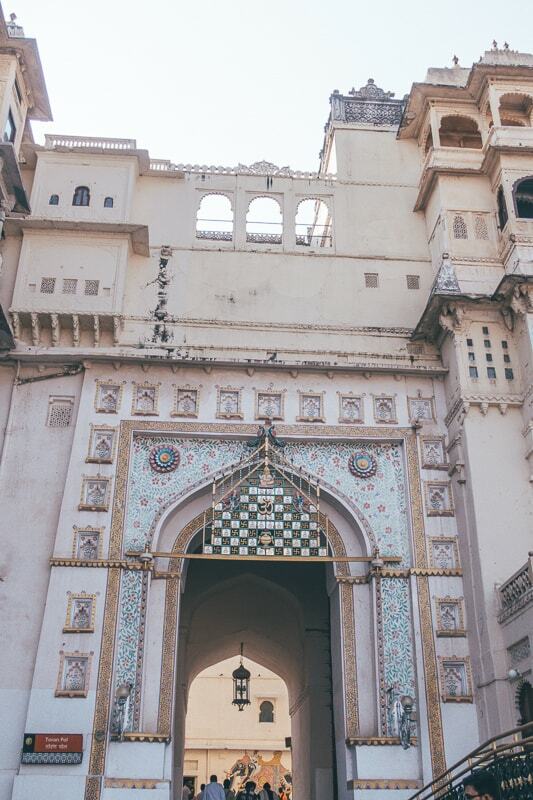 The Udaipur City Palace is one of the main, (if not the main) attraction in Udaipur and it should definitely be on your list of places to visit in Udaipur in 2 days. It will take around an hour or so to explore this beautiful palace and it’s a cheap experience. I would recommend getting a guide to tell you all the stories and history of the place. It’s not expensive and whilst everything is in English, you still miss out on some of the essences without a guide. Pichola Lake is an artificial freshwater lake and one of the largest and oldest lakes in Udaipur. It is famous for its scenic beauty & surroundings. Basically, it’s the tourist hotspot and it offers some fabulous dining options with a beautiful view of the lake. We dined at one of the restaurants near the lake for sunset dinner and drinks and it was well priced, great staff and good cocktails, plus the view were beautiful. For the life of me I can’t remember the name of it, but I am pretty sure it was on the first page of Tripadvisor for restaurants near lake Pichola. I think the lake is best appreciated in the evening, so make sure you include it in your Udaipur 2 day itinerary. This is one of the best places to visit in Udaipur at night. You can hire a boat for the day and go to the lake, or you can even take a sunset boat ride which whilst I didn’t do it, sounds pretty romantic. This is a fabulous Hindu temple just outside the city palace. It’s dedicated to Vishnu (preserver of the universe). You’ll naturally see this site on your journey to the temple. 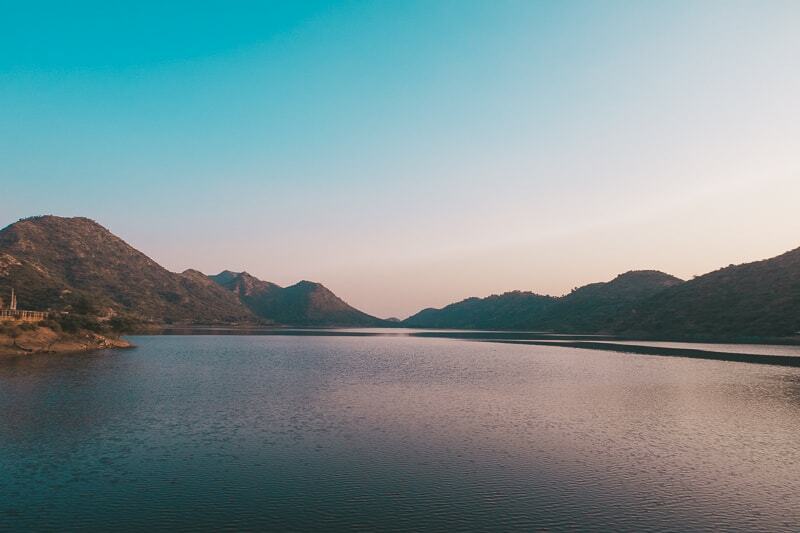 Another essential lake on your list of awesome places to visit in Udaipur in 2 days. 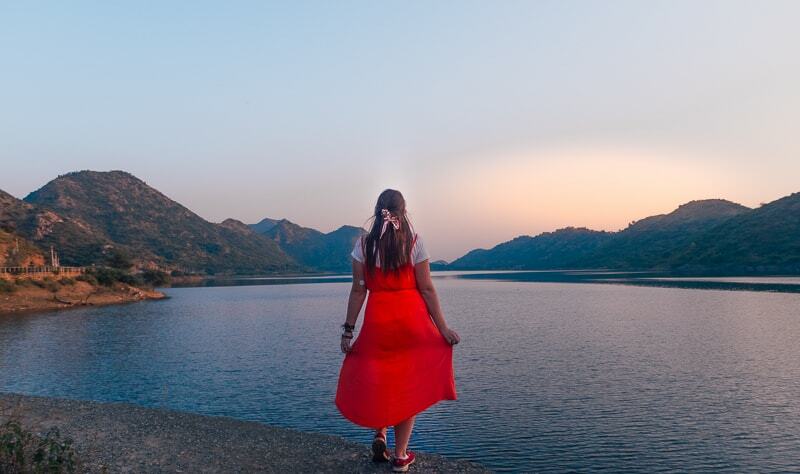 It’s located north of Pichola lake and is just as beautiful. It may even be considered more beautiful due to the fact there are fewer tourists there. Around sunset, you will see lots of local families standing around ready to admire the beautiful view, and you should too! There are a couple of street food vendors around if you’re feeling peckish. 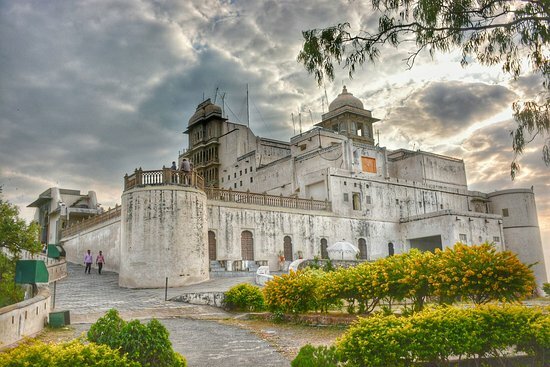 If you seek beautiful views of Udaipur from above, then this is a great spot to visit. You can get an organised tour packages here from any of the tour agencies, rent a tuk-tuk or taxi, or rent your own moped to get up there. It’s on a hilltop so naturally offers panoramic views of Udaipur. 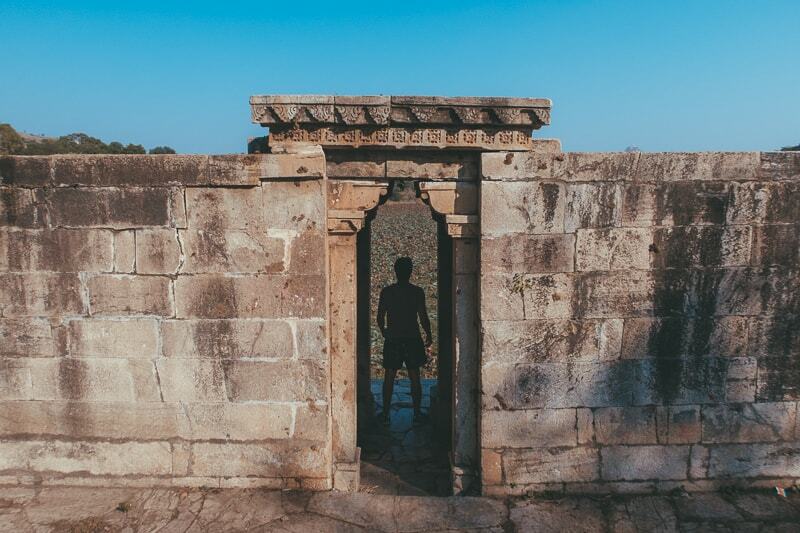 Unfortunately, this is something I REALLY wanted to do, but couldn’t do, so please include it on your places to visit in Udaipur list and tell me what it was like! It’s open from 8 am to 6 pm. *Important note* You have to pay to enter the park that surrounds it. This is the largest garden in Udaipur spreading over 100 acres, so if you like nature and beauty, this is a good place to visit in Udaipur. As a rose lover, this place will also delight you, there are LOTS of varieties of beautiful roses. Aside from the gardens, there is also a zoo on-site which is good for entertaining children. The zoo is open from 8.30am to 6 pm whereas the gardens are supposedly 24 hours. Another spot I wanted to visit but didn’t get the chance to visit was the Udaipur Solar Observatory. (Well, I drove past it on the moped- does that count? :P ) It’s open from 10 am to 6 pm and there is no entrance fee. It’s regarded as the best solar observing site in Asia and since it’s on the lake, it’s probably best seen from afar. This is located just below the monsoon palace, and it’s the place I was saying you get charged to go into because you are going through it to get to the palace. (Or if someone knows different then tell me, but the guard insisted that’s what happens) It’s a zoological park filled with wildlife and plants galore. If you’re heading to the Monsoon Palace anyway, then I guess it’s worth a stop. There are lots of chance to buy presents in Udaipur and there are lots of markets happening every day. I got myself my “famous” blue skirt in Udaipur for a couple of pounds. I say famous because you’ll notice I wear it a lot in my India photos. (I had a green skirt from home, but it ripped). Just wander around the main tourist area which is near the city palace and you'll naturally go by lots of markets. Fancy something truly different whilst in Udaipur? Then add the Marvel Waterpark to your list of places to visit in Udaipur in two days. It’s cheap, cheerful and has very mixed reviews. Our plan was to go here, but we decided against it in the end, so I would love to know what people thought if they went. A mean, for the price of 400 for adults and 250 for children, it’s not exactly a big loss if you hate it! When it comes to Udaipur tourist places, this one doesn't always make the list, but I don't understand why. Without a doubt, my favourite lake in all of Udaipur. It’s quiet, beautiful, peaceful and you might want to spend all your time there. We visited twice and it’s a beautiful place to catch a sunset. I am so glad there aren’t many tourists here, because it truly feels like it’s just you (and the massive monkeys). When you have a moped it’s easy to reach here. You can also “hike” above the lake to a viewing point, but I’ve only ever seen pictures on Instagram of this happening, so if you’ve done it, tell me! 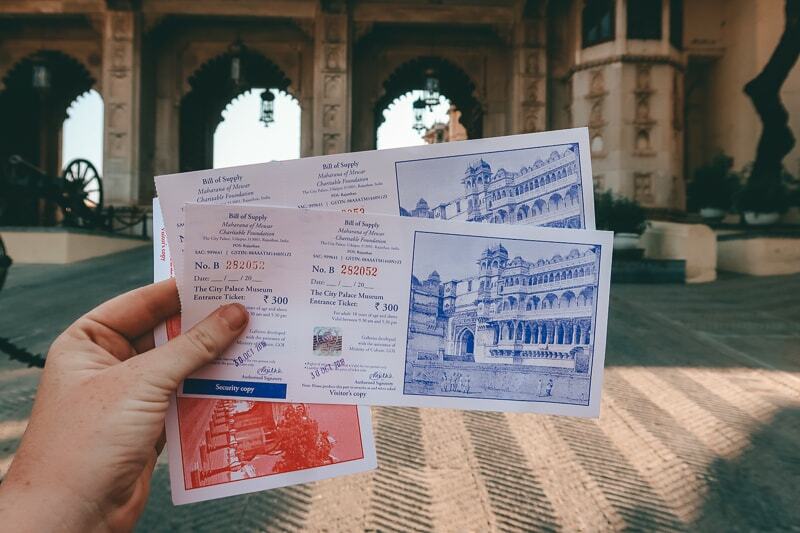 Renting a moped is definitely the best way to see all that Udaipur has to offer. We decided to take ourselves well outside the city area on a day trip and see what other temples and views were on offer. We visited Sas Bahu Temple and Shri Eklong Ji Temple, both of which were worth a drive. One temple was under construction and the other was totally abandoned and no way in, so we simply walked on top of it and looked in. Still worth exploring and seeing something different. So, let’s break this two day Udaipur itinerary up into two actual days. Here’s what I recommend. If you've got more than 2 days in Udaipur, then you can easily slow these places do and add other places to visit in Udaipur in 3 days. But, if you start your day early, then you can easily see all these awesome places to visit in Udaipur in 2 days. You will see this advertised in all the tour agents in Udaipur, and it can be done as a full or half day trip. It’s a fabulous fort and it looks very interesting. 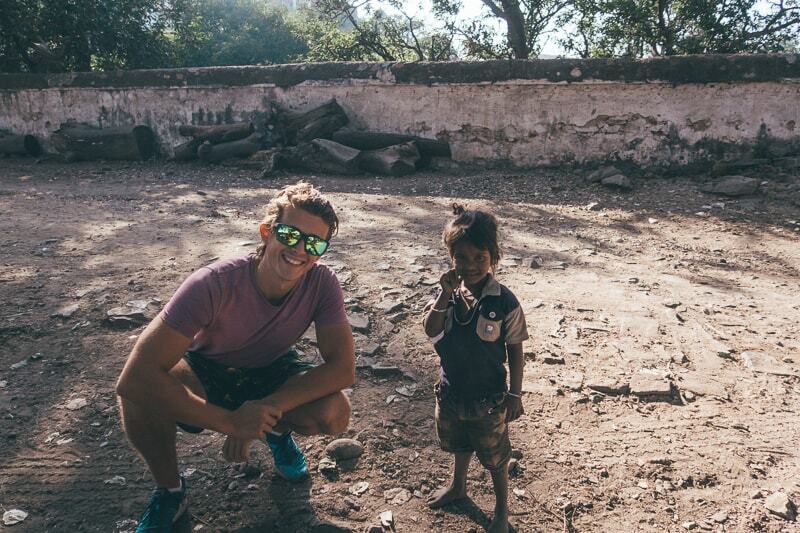 We didn’t have time, and you would only be able to do it if you had 3 days in Udaipur. Udaipur has got a good variety of ATMs. If you use a Revolut card ( a travel card that gives you the best exchange rate on the market- so why not!?) then use the Bank of Baroda, as it doesn’t charge you for withdrawals. There is one or two in Udaipur. Most restaurants and hotels take card too and even the markets, but it’s best to have some small change for haggling or tuk-tuk fares. There are many options for getting around Udaipur, including tuk-tuk, Uber/Ola and moped. Uber and Ola are super convenient and the cheapest way to get around without a doubt. Having a local sim is useful for having data to order them anywhere (Airtel is the best network, and it’s super cheap to get a sim- you’ll just need your passport, visa and a passport photo and head into any Airtel store). Tuk-Tuks can be rented via Uber and Ola too, or you can negotiate. A good thing to do is look on Ola and see how much the journey is supposed to be, then you’ll have a rough idea of what’s fair when you’re haggling for a price. Generally, you go 50 rupees higher than what the Ola says and you’ll probably come to a fair deal. Moped: You can easily rent mopeds in Udaipur. There are vendors all over the main city advertising it and it’s cheap and fuss-free. They will take either your driving licence (don’t give your passport) or a deposit. A moped gives you more flexibility to visit the other lakes and sites we’ve spoken about without a time limit. If you want to see all the brilliant places in Udaipur in 2 days I’ve recommended, then a moped is a good shout. If you’re heading towards the cultural triangle, then I recommend hitting up Jodhpur next. It’s an easy bus ride away and there is a great guy in Udaipur who can organise buses and trains for the rest of your trip. He takes a 50 pence commission, so it’s worth the convenience, plus he can find you trains which are a nightmare to find anyway. Trains book up super quick. He’s a super friendly guy and the one we used, so I shan’t complain! The bus he booked us to Jodhpur was super comfortable, clean and modern. I hope you’ve enjoyed my post on the 12 awesome places to visit in Udaipur in 2 days. If you’ve got anything else you think I should add to the list, then let me know. Happy travels!